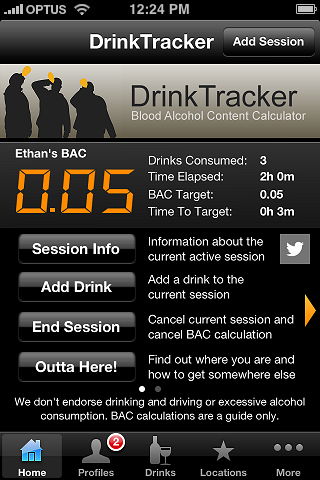 Use your iPhone or iPod Touch to keep track of your BAC (Blood Alcohol Content) while you’re drinking with the DrinkTracker personal breathalyzer simulator and BAC calculator app. Quickly and easily keep a record of what you’ve been drinking with the fully editable one-tap drinks list - add your own favourite drinks to the drinks list as well and sort them into any order you want. One-time set up of personal profiles including gender, age, height, and weight means you don’t have to constantly re-enter personal details. Just select a profile at the start of a drinking session. 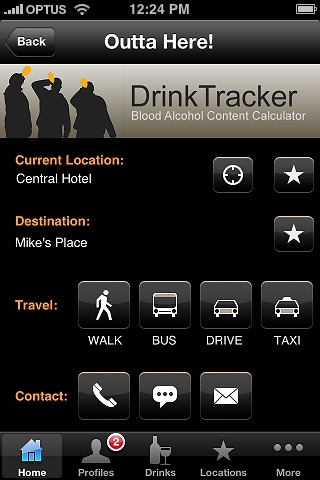 DrinkTracker automatically compares your alcohol intake and your metabolic removal rate and updates your current Blood Alcohol Content every 60 seconds. Even if the application is turned off, when it’s started again it will pick up where it left off, retaining the previous drink and profile details and then recalculating your BAC ready for the addition of more drinks. 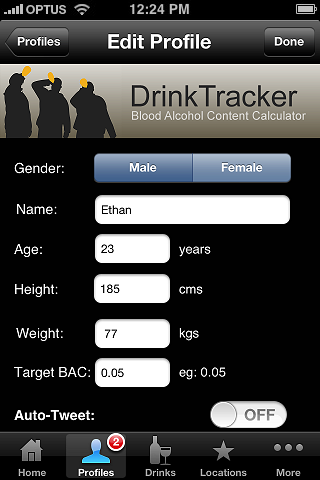 As part of your personal profile set up, set a target Blood Alcohol Content and a countdown timer shows how long before that target BAC is reached. 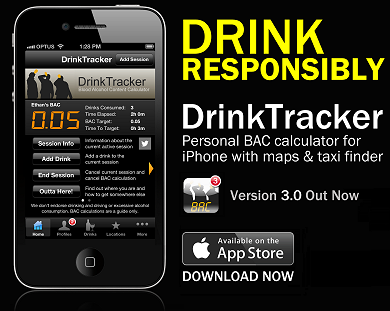 With support for Imperial, US and Metric measurement systems, the DrinkTracker breathalyzer simulator iPhone app is the perfect companion for anyone planning on having a few drinks responsibly. Multi-User! 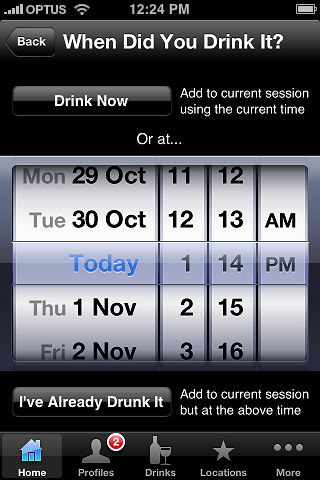 It's been a long time coming but with Version 3 you can now keep track of seesions for multiple drinkers simultaneously. Auto-Tweet - Optionally enter your Twitter account details into your profile and let everyone know when you have a drink. Google Maps - Yep still got 'em, even if you're running iOS 6.
iOS 6 and Retina - We've upgraded all the bits needed to keep in line with iOS 6, as well as a graphics upgrade for Retina. 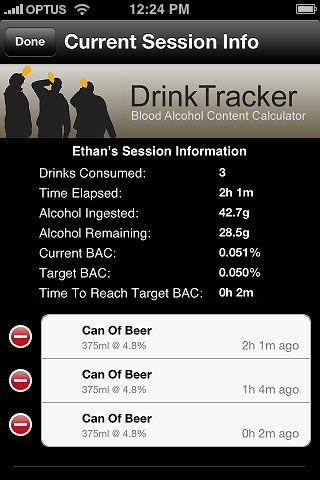 Blood Alcohol Content calculated and displayed in real time, even when the application is turned off. No manual refreshing or re-inputting required. Supports Imperial, US and Metric measurement systems. 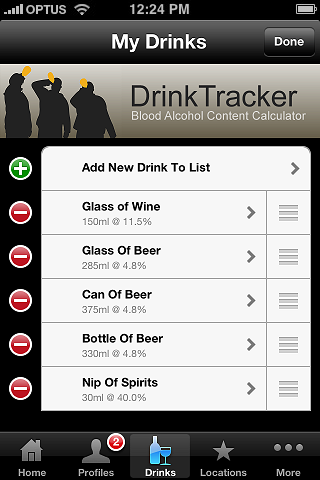 Unlike some other apps, the BAC calculations in DrinkTracker take into account the age, height, weight and gender of the user. Don't be fooled - an accurate calculation cannot be made without all 4 of these data items. 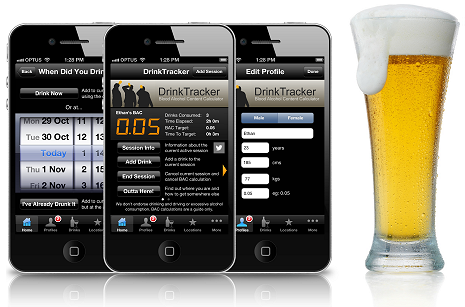 Store and retain editable profiles (age, height, weight, gender) for multiple drinkers. A target BAC can also be set for each profile, with a countdown timer showing how long before the target BAC is reached. BAC display is colour coded to show when BAC target has been reached. Don't get stuck with a fixed list of what someone else thinks you should be drinking - add your own favourite drinks to “My Drinks” for fast and easy selection later on. All drink details are fully editable at any time. Manually sort your drink list into the order you want. Add drinks to the current session now or at a previous time. You can also remove drinks after they’ve been added if you make a mistake. Full report on current drinking session including duration, details of drinks consumed and time left to reach target BAC. Find your way home GPS based feature called “Outta Here!”. Based on where you are and where you want to be, use Google Maps to get travelling directions (home or to the next pub), find a taxi in your immediate vicinity, or email a friend with your current location for a pickup. It also allows for phone or SMS contact via your Contacts list from within the app. 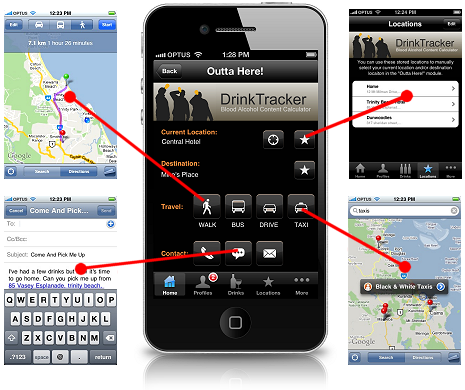 DrinkTracker does not endorse drink driving or the excessive consumption of alcohol. Blood alcohol calculations are to be used as a guide only.